Known for mimicking the motion of running, elliptical trainers are low impact and provide an effective cardiovascular workout that greatly reduces the stress placed on your hips, knees and ankles. 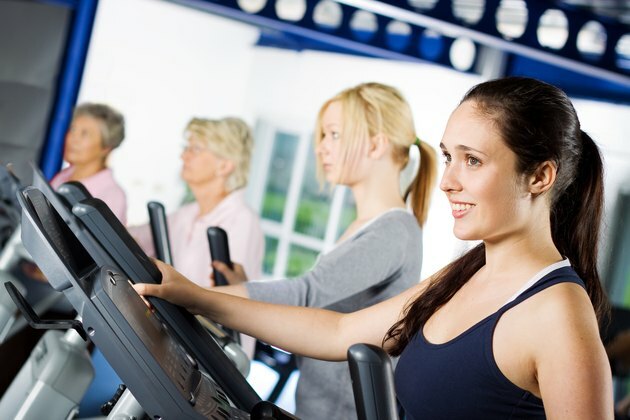 Either running shoes or cross-trainers are best to wear when using the elliptical, with the difference being dependent on personal preference. Both types of shoes will protect the foot, and subsequent muscles, joints and tendons, during your workout. When working at a steady, moderate pace with an appropriate amount of resistance, elliptical machines train your cardiovascular system, strengthen your lower body and burn calories – usually between 500 to 800, depending on your weight, in a 60-minute workout. On most ellipticals the pedals glide either back and forth or in a circular pattern as you perform a running motion. A benefit of ellipticals over other fitness equipment is that they allow you to pedal backwards, which helps to target your glutes, hamstrings and calves. Running shoes are designed to propel you forward and it is this forward motion that is most often executed on an elliptical trainer. The best running shoes will properly fit your foot while offering plenty of arch support, stability and cushioning. Shoes made for road running, which are generally light and flexible and primarily designed for flat surfaces, are optimal over trail-runners for the elliptical's even-tread pedals. Cross-trainers are versatile athletic shoes that can be worn during various activities, including when using the elliptical trainer. Usually designed with wide and stable outsoles, cross-trainers provide stability and support for your feet and ankles. Cross-trainers can lack cushioning, which makes them a poor choice for actual running, but the shoes work well on the low-impact elliptical. Though you remain steady on the elliptical trainer, it is still important to protect your feet with shoes that are appropriate for your level of pronation, which is the inward roll of your foot that takes place from landing to push off. Overpronators have an exaggerated inward roll, while supinators tend to roll to the outside edges of their feet. Consult with a specialist at a running or sporting goods store to have your feet evaluated correctly. Avoid wearing shoes made for specific sports, other than running, on the trainer, such as tennis or soccer, which do not contain proper support for the elliptical. EllipticalTrainers.com: What Are the Benefits of an Elliptical Trainer?